The fish tacos and Salmon were not the only seafood items that I had while I was in Seattle. 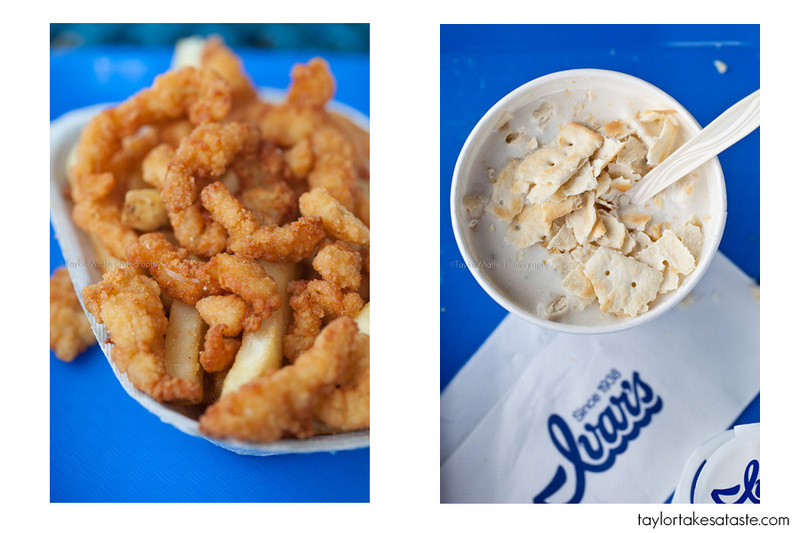 I also had fried clams and clam chowder at Ivar’s. 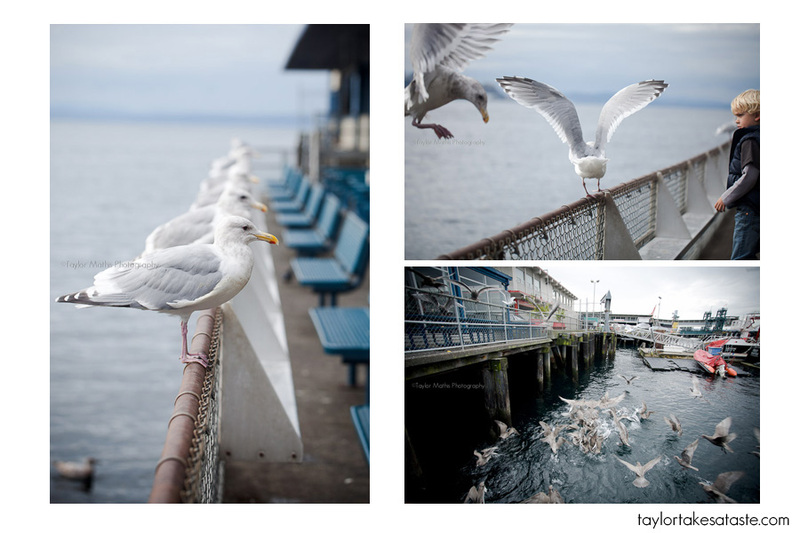 When dining at Ivar’s I had a few unexpected guests (they were not of the human kind). 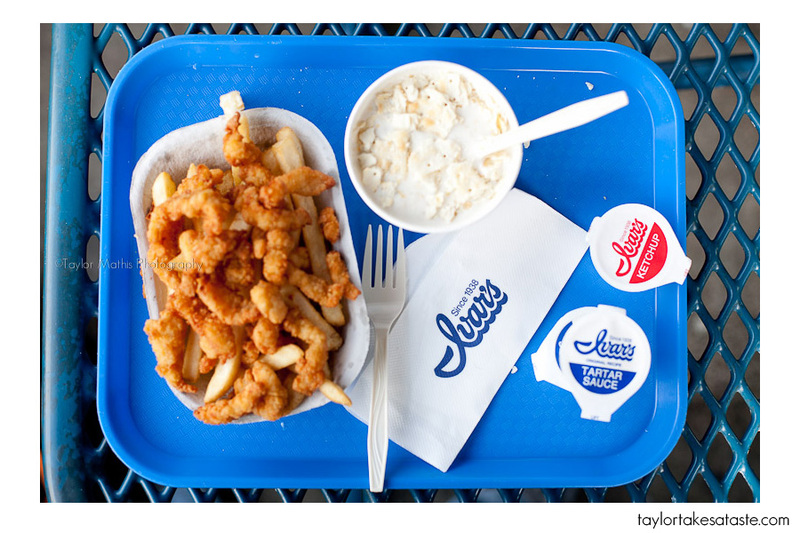 Ivar’s has been around since 1938, serving the Seattle with amazing seafood. 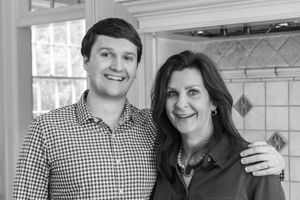 They have grown into several restaurants and 26 seafood bars throughout the Seattle area. I went to the seafood bar adjacent to their original Acres of Clams location. The seafood bar specializes in fried seafood dishes and their famous chowders. I went with fried clams and the clam chowder. The fried clams were delicious. They had a nice amount of fried coating with tender strips of clam inside. Served with crispy fresh french fries, I can see how I was not the only ones interested in them. When at Ivar’s, there is no way I could pass up their clam chowder. I went with the creamy white New England style, but they also have the red Manhattan and Salmon chowder. The New England was amazing. It was just the right consistency, not too thick or two watery and with the right amount of clams and potatoes. The flavor was full and rich with a nice shellfish taste to it. 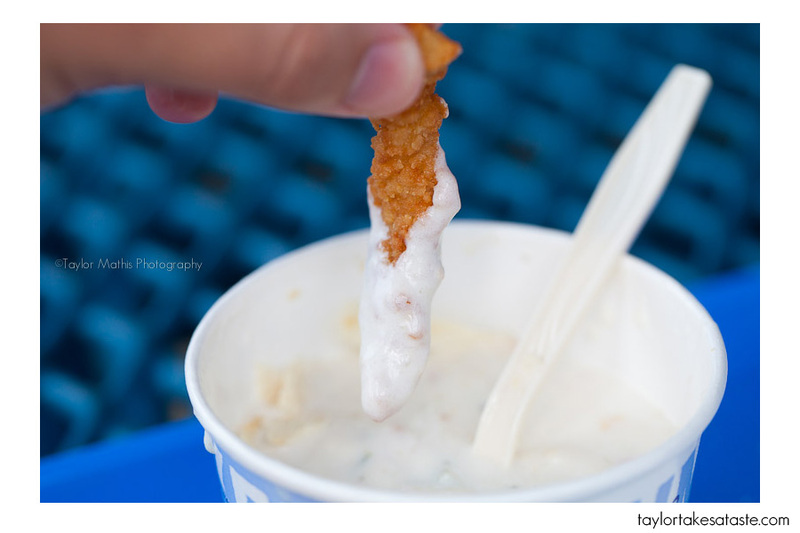 I couldn’t resist dipping fried clam into clam chowder. 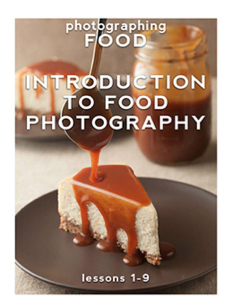 It was as good as I had imagined it to be. 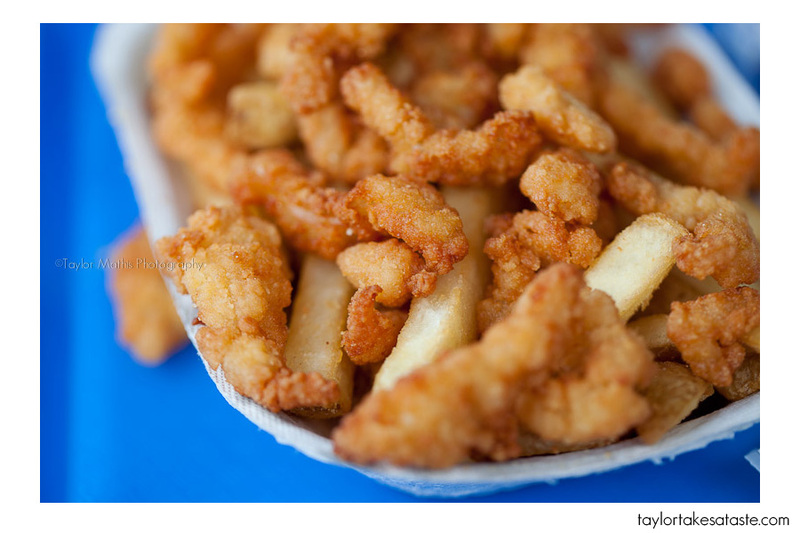 I have eluded to “others” who are interested in my french fries and seafood. Well those others are seagulls. There is a reason why Ivar’s offers both indoor and outdoor seating. When you are inside, you don’t have to worry about your new found bird friends sharing your meal with you. 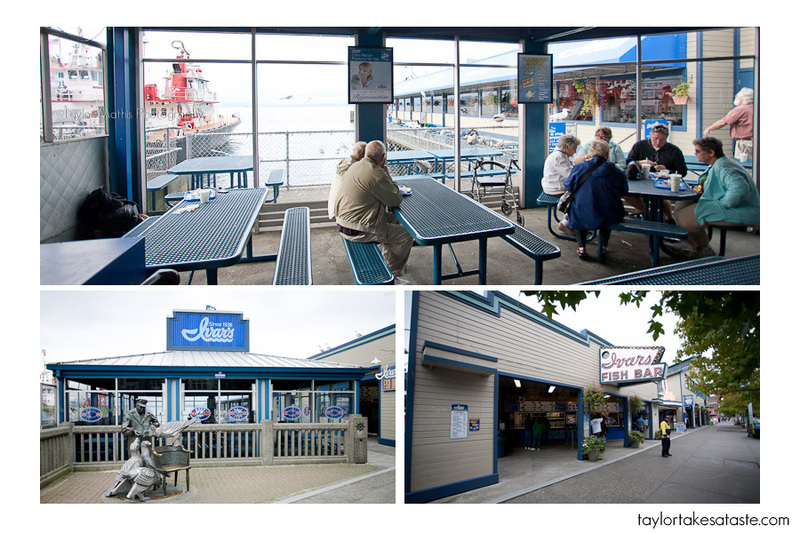 Ivar’s is located on Pier 54 in down town Seattle. 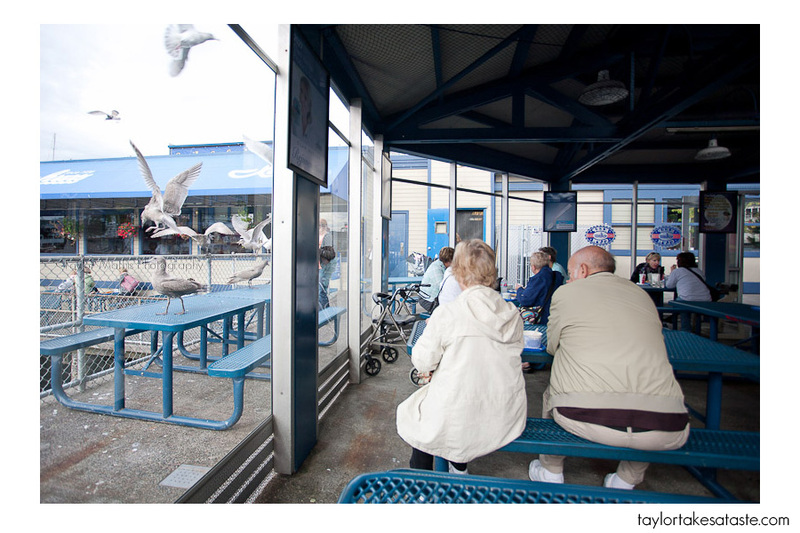 Due to the close proximity to the water and the delicious food they serve, Ivar’s has developed quite the following from the bird community. 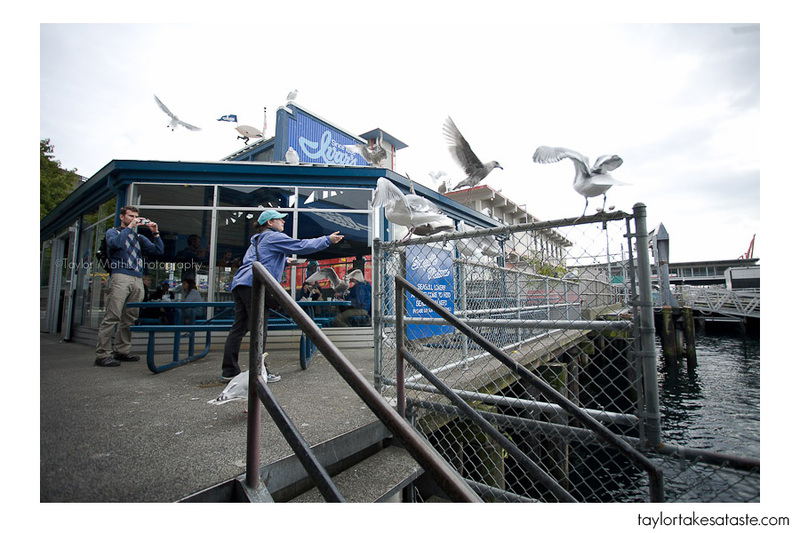 Seagulls hang out on the fences around Ivar’s. When sitting outside, you will need to keep an eye on your food, otherwise you might have an unwanted dinner guest joining you. If you have fries left over you can give them to your new found bird friends. As you can see, they enjoy Ivar’s just as much as the human patrons. 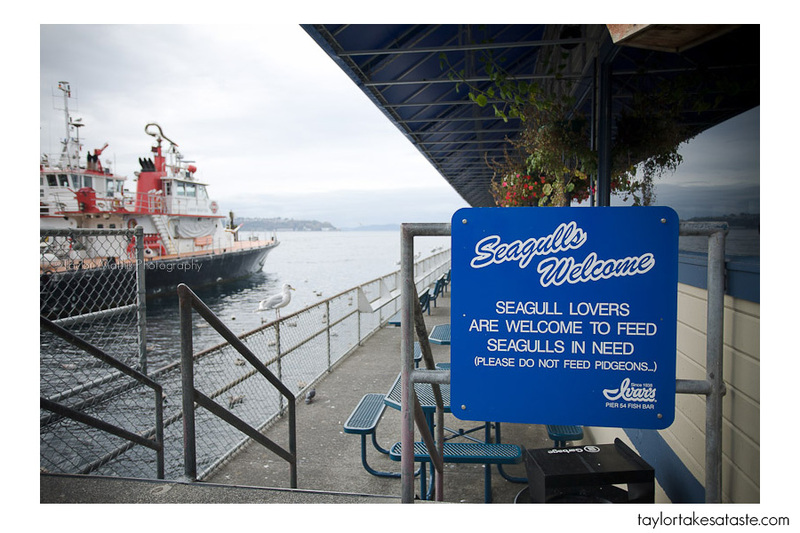 Ivar’s says that the fries do not hurt the gulls because they only eat what they need, so I am going to assume it is safe for them. I finished all of my french fries, sorry birds. I did enjoy watching other people make friends with the birds. I have talked about eating seafood with an ocean view in Malibu and Santa Barbara, but this was the first occasion where I have had birds join me. If you don’t care to share your meal with the birds don’t worry, you can always sit inside the enclosed eating area. Regardless if you eat alone or with the birds Ivar’s on Pier 54 is a very unique dining experience. This past weekend, I was tailgating in Knoxville at the University of Tennessee. On Wednesday, I will share with you what I discovered! Stay tuned and have a great week. Looks like a great place, but us folks in New England, really only like the whole clams fried, no strips for us!!!! The clam chowder looked great!! Will put this place on my list to visit when we go to the north west! This place look amazing. 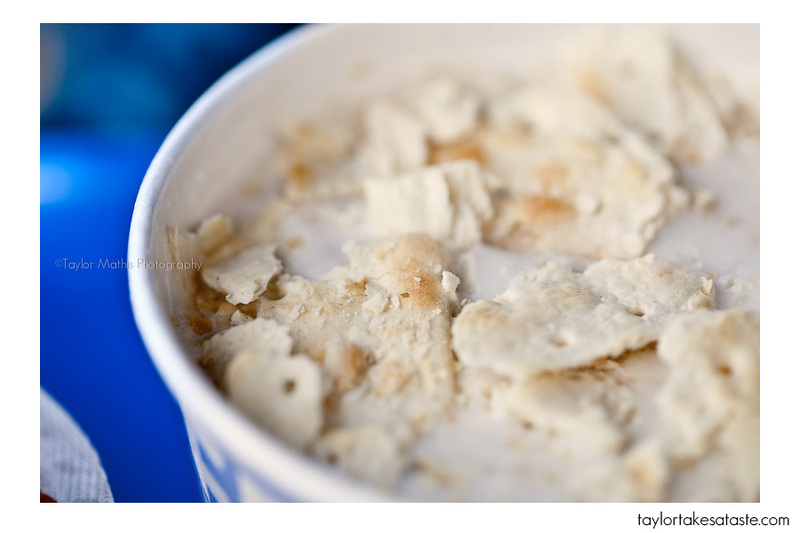 I love clam chowder and I bet the combo of the fried clams with the thick, creamy chowder is quite tasty. I really like the picture of the sea gulls lined up on the fence. What a great post! I love the seagull photo. It’s amazing that you could get such a great shot of them all lined up-like you told them what to do and they actually listened! Seagulls can be a real pest just like pidgeons and they can ruin a meal out if one of their droppings should happen to splatter on your platter or add some whitener to your coffee.